The new 2019 Street Scrambler is built for smooth road-going handling with an iconic style and rugged off-road attitude for riders who want the best in terms of all-round performance and high levels of torque and technology. 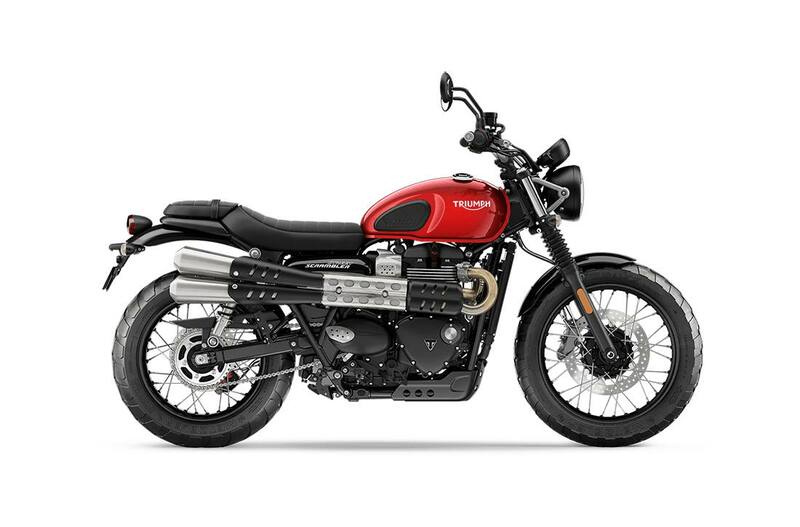 This is a beautiful bike with higher specifications than ever before; most notably an updated 900cc Bonneville high-torque engine and twin high level exhaust system that now produces 18% more peak power and an even richer British twin scrambler sound. Other high specification improvements introduce new Brembo front brakes, new wider-spaced cartridge front forks, dual-purpose Metzeler Tourance tyres, and a new ergonomically-designed adventure-oriented seat finishing that all contribute to a substantial improvement in control and comfort on an already-capable ride. There’s also an even more beautiful scrambler focus to this latest generation, with class-leading technology (including Road and Rain riding modes) together with brand new contemporary scrambler styling and a greater level of finish and detailing over the whole bike. If you’re looking for authentic modern classic scrambler appeal, this is the perfect bike for you. Improved Capability: The Street Scrambler’s power and performance is now even better with new generation updates that deliver an 18% increase in peak power (to 65PS) and even higher specifications including Brembo brakes and cartridge front forks, as well as key features such as switchable ABS and traction control, and torque-assist clutch. Classic wire-spoked wheels, a scrambler chassis set-up, and that distinctive twin exhaust system complete the beautiful scrambler silhouette. Enhanced Technology: Significantly updated technology has been sensitively incorporated to minimise the visual impact of the new Street Scrambler. As well as new first-in-class riding modes, other key rider focused technology now includes ride-by-wire, clean line ‘hidden cat box’ pipe run, immobiliser, and USB charging socket. New Contemporary Branding: This latest generation Street Scrambler showcases its new logo as a graphic on the new side panel. New Instrument Styling: A new instrument bezel has an eye-catching metallic embellisher with Bonneville branding, while the new dial face has a translucent silver finish with more integrated alert lights and a multi-function display including digital rev counter. New Adventure-Oriented Seat Finish: The twin seat set-up has an ergonomically-designed leather and textile construction that provides superior ride comfort whether seated or standing. The pillion seat is interchangeable with an aluminium rear rack that is perfect for solo adventures. Wider Spaced Front Forks: Wider-spaced forks give a more purposeful and distinctive scrambler styling that includes revised front mudguard, yokes, and headlight brackets. Adventure-Style Front Pegs: High grip ‘bear trap’ steel front pegs with removable rubber inserts and robust steel brake pedal help you stay sure-footed during your ride. All-Terrain Bash Plate: The 3-piece moulded utility design provides a stylish look and more durable defence for the underside of your Street Scrambler. 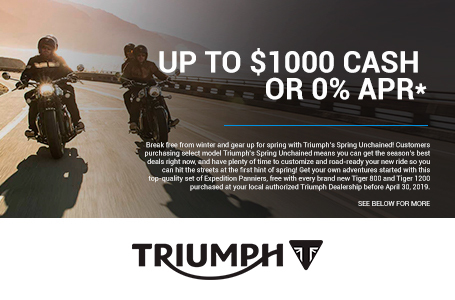 Unique Rubber Knee Pads: Get a stylish dual benefit of added grip and protection for your tank with Triumph-branded signature rubber knee pads. Stripped Back Custom Styling: An iconic Bonneville silhouette incorporates modern scrambler-type finishes including elegant fuel tank with unique fuel cap, black engine covers with Triumph branding, and stylish single throttle body with aluminium finisher. Dual-Purpose Tyres: Metzeler Tourance tyres are fitted as standard to the Street Scrambler. Developed for maximum mileage on the street and great traction on light off-road surfaces, these tyres have great grip and precise handling in all weathers and road conditions. Front Wheel: Spoked, 2.5 x 19 in. Rear Wheel: Spoked, 4.25 x 17 in. Rear Suspension: KYB twin RSUs, with pre-load adjustment, 120mm rear wheel travel. Front Brakes: "Single 310mm floating disc Brembo four piston fixed caliper, ABS "
Instrument Display and Functions: LCD multi-functional instrument pack with analogue speedometer, engine rpm, odometer, gear position indicator, fuel gauge, range to empty indication, service indicator, clock, 2x trip, average & current fuel consumption display, traction control status display, heated grip ready - controlled by a handlebar mounted scroll button. KYB twin RSUs, with pre-load adjustment, 120mm rear wheel travel.